Physical description: attains a maximum length of about 60 centimeters, but most species are smaller. They vary in color. Piranhas have been known since the discovery of South America. The fish are known to be abundant in the rivers of eastern and central South America. This fish is also known to some as the Caribe or Piraya. The piranha is typically known for its razor sharp teeth and its strong jaws. The recognition they get is from their reputation for dangerous behavior. They usually travel in large schools. 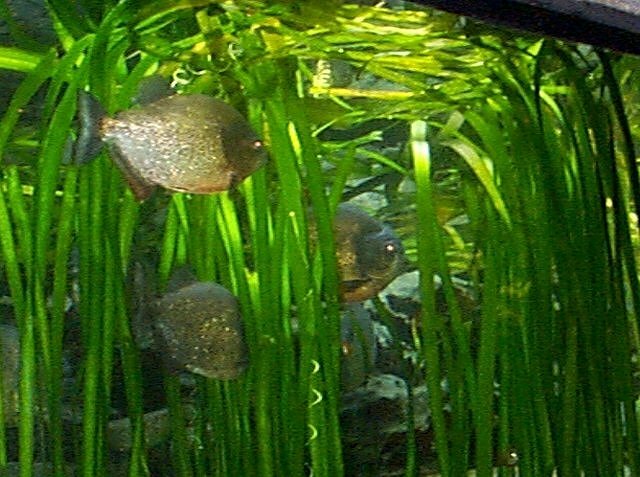 Piranhas belong to a large family of fish called the Characins, which also includes the Cardinal Tetras and the Blind Cave Tetras that can be seen just around the corner from the Piranhas in the aquarium. These fish can get as big as 60 centimeters long, but most are smaller. They vary in color; some are silvery with orange bellies and throat, the others are mostly black. They all have deep bodies, and saw-edged bellies, and large, blunt heads with very strong jaws bearing triangular razor sharp teeth that cut like knifes. They prey on dead fish and rarely attack live prey. If provoked they have been known to bite. Comments about the piranha of the Fort Worth Zoo. The piranhas at the Fort Worth zoo were very interesting to watch. Seeing their natural habitat in person and how the fish acted under water was a real interesting sight to encounter. The fact that you don't see these fish on a daily basis and they aren't even in our country makes it worth going to see them at the zoo. I observed that the fish likes to swim in pack with other piranhas. The fish is sometimes presented as anl aggressive fish. I found out that the fish got a bad reputation from explorers. The fact is , is that they aren't blood thirsty fish, and some species are even vegetarians! I thought the fish looked really spectacular and was very engaging to look at. I noticed that the fish was not as big as I thought it would be. "Piranha". Grzimek's Animal Life Encyclopedia. 1975ed.